OK, so I’m a bit torn on this one. While I absolutely loved the concept of a society divided by blood (and power) and a lead character who challenges all that, I’m not sure Mare (the lead character) was the most likeable or even the most relatable character in the world. I had very high expectations for this book because of all the hype around it, but I’m not sure it delivered… Don’t get me wrong, it’s a good dystopian story but there were a couple of major flaws involved. I mean, in the space of 12 hours (from early morning to dinner time) Mare goes through 3 (yes, THREE) major life-changing events! If any of those incidents had happened in any other book the main character would get at least a couple of weeks (in story time) to deal with all that! Yes, I get that the author was excited to get to the meaty part of the story as soon as possible, but I thought it was too much in the time frame they had. But it’s not all bad news, there were some good bits as well! 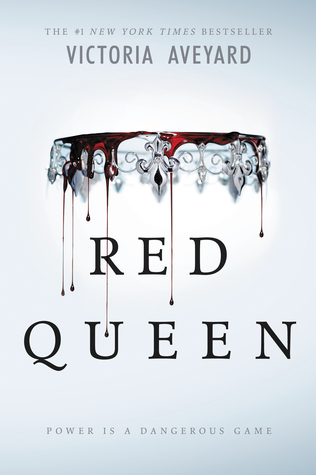 I loved the plot and the world that Victoria Aveyard built in this book. And that plot twist?! I was kind of expecting something like that to happen, but nothing as brutal as that! That was such a Game of Thrones moment! So as you can see I have developed a love / hate relationship with this book. Haha! And for that reason I’m giving it a 3.5 (the plot twist alone bumped the score up by a whole point). Have you ever read Red Queen? What did you think about it? Should I read the next book in the series (Glass Sword) or not? Colouring Books: Yay or Nay? This book is on my TBR. I’ve been on the fence about reading it because of all the hype, but I’ll give in eventually 🙂 I can’t resist a good dystopian. Really? What made you do that? Was it Mare? Haha! I don’t think it was Mare, really… I just couldn’t get into it.